Building on the City of Cambridge’s continuing mission to create a more playful public realm, the City along with Cambridge Arts commissioned New York-based artist team of Chat Travieso and Yeju Choi to create a distinctive public-art project for a shared bicycle/pedestrian path that aims to ease traffic and transform a utilitarian path into a striking public space that integrates play for all ages. As part of the Alewife sewer-separation Project led by Public Works, Fern Street was selected as a safe-passage to nearby Danehy Park and surrounding neighborhoods. The concept for the Fern Street path, titled “On the Other Side”, was to incorporate unique topography and pattern, and to weave them together for a sensory and tactile experience. In addition to being colorful and fun, they wanted it to be engaging like an obstacle course and credit the idea from their observations of kids at play and how they interact with their environment. They further developed their design-intent by means of collaboration with City departments and a series of workshops with students before approaching us on how to bring their design to reality. 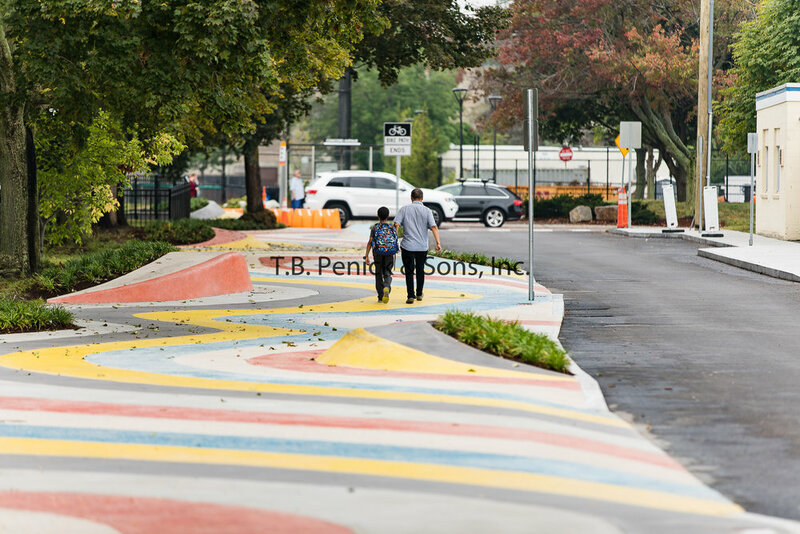 With our assistance, Lithocrete was selected as the medium of choice to realize the wavy bands of bold colors & varied textures. To achieve the bold yellow, red, and blue colors, white cement with integral color and glass of different shades of color and size were utilized. The dark-gray band utilized the Lithocrete Presto-Pneumatic system to embed a fine reflective material onto the surface.